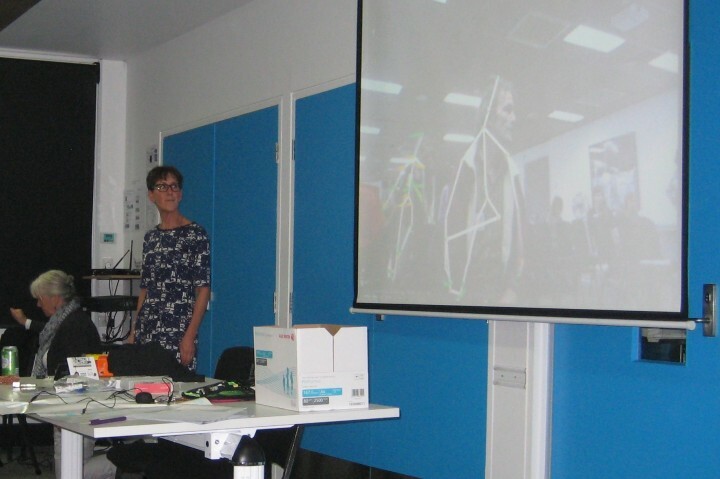 The team at Egenis, Exeter University have been working with ReacTickles Magic and Somantics as part of their project, Exploring Diagnosis. 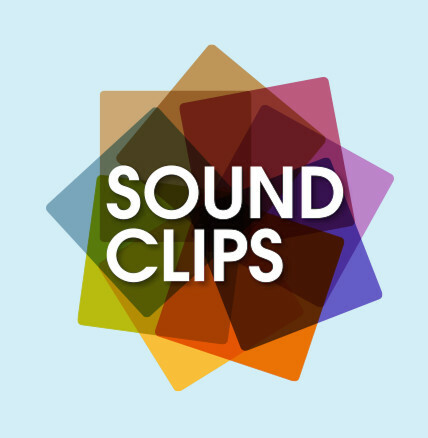 Funded through the Wellcome Trust, the project team have been running animation workshops with adults on the autism spectrum and film production company Calling the Shots. Most exciting has been the interest in the original ReacTickles, and as a result Joel has been busy creating some fantastic web based ReacTickles, which we will be releasing very soon. We made some lovely new discoveries for Somantics when we participated in the Fun Palaces weekend, organised by artist Terry Chinn. 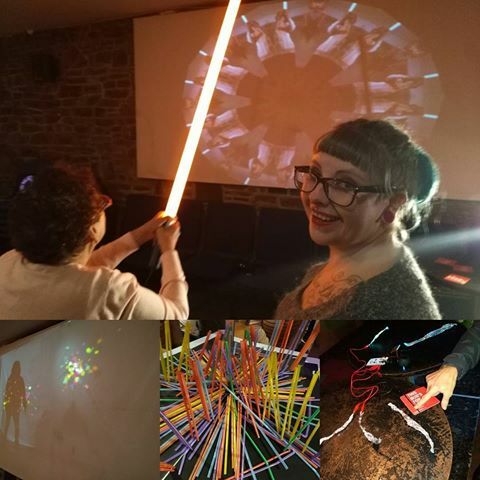 Using a light sabre as an input device generated some gorgeous, distinctive patterns with Kaleidoscope, which contrasted with the more subdued mix of human body patterns. This one-day conference brought a diverse range of speakers and delegates together to share research, practical experiences and ideas for technological innovation. Jamie and Lion set the tone for understanding the impact of technology in day-to-day living – for communication, work and leisure. Our talk offered a journey through our experiences of developing software, focusing on Attention, Perception, Feedback, Repetition and Flow. We used this opportunity to launch the first release of Somatopia, which aims to bridge the gap between genuine innovation and end users who are disenfranchised through perceptions of disability and lack of resources (human and technological). We hope that by making the software, code and instructions for designing Somatopia apps available to download, Somatopia will appeal to enthusiasts with expert knowledge, and those who enjoy making and tinkering with technology. See more on the Somatopia page. Wendy has been in Melbourne, Australia during November, sharing both the Somatopia and Somability projects with Scope Victoria, and presenting at the prestigious 50th Anniversary ASID conference. Both events have led to connecting and sharing ideas with some fantastic people, especially excited to meet up with Sensorium Theatre, Perth, and Back to Back Theatre in Melbourne. There is a link to the presentation ASID slides, with the images extracted. Great to share insights and experiences of the “flow state” with Damian Milton at the first NAS design and autism conference. 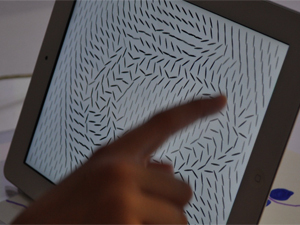 From the earliest days of designing ReacTickles we noticed how anxiety reduced and happiness increased when children were absorbed in their flow of interest, so it was fantastic to hear Damian’s view on this. Here is a lovely video of the Accolade Awards. The judges were impressed with how the Somability approach to technology could offer new experiences with a traditional service, and cited the project as a “fine example of and co=producing and co-creating”. Here are the judges comments. Here it is at last, the latest version of Somantics for iOS 8.3. Many thanks to Marek and James! We are thrilled to announce that following interviews with the judges we reported on in a recent blog, Somability is one for three finalists in the “Better outcomes through working together” category of the 2015 Accolade Awards. Today the film crew interviewed staff and service users at Rhondda Cynon Taf, Gadlys Learning Curve in preparation for the Awards ceremony at Cardiff City Hall on Thursday, 18 June. 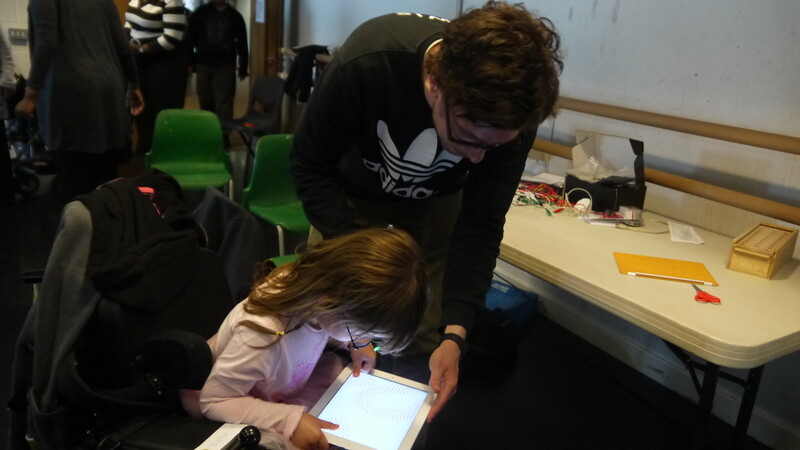 We had a great time co-designing interactive artworks with young people from the Noah’s Ark children’s hospice at artsdepot. 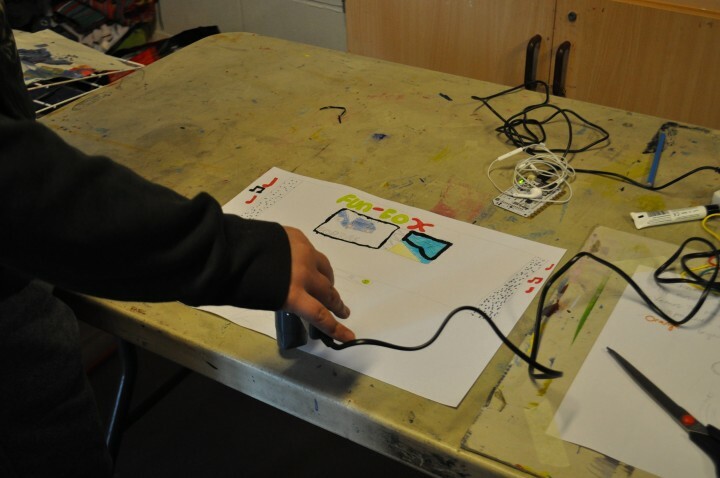 Using the fabulously accessible Touch Board from Bare Conductive. The participants collaborated in teams to bring their favourite things to life by adding their own sounds to drawings. The culmination of the workshop was a set of paper-prototype “happiness machines” that included tickling, laughter, jokes, music and other references to the things in life that make us happy. 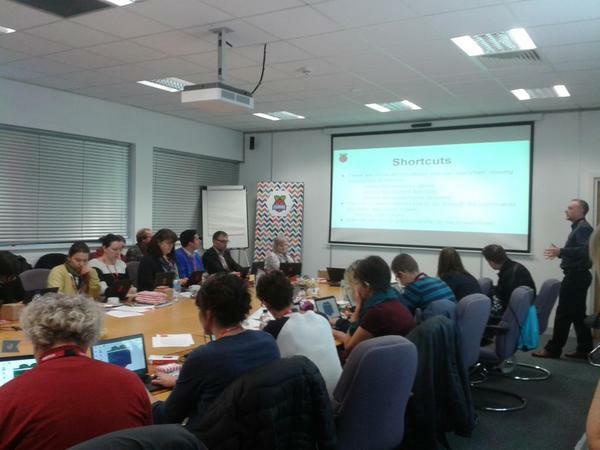 First ever Cariad Interactive Somatopia Lab in Cardiff FabLab. Four teachers, two pupils and a technical demonstrator joined us for a rich mix of acting, moving, paper prototyping and storyboarding based on five Somatopia themes. 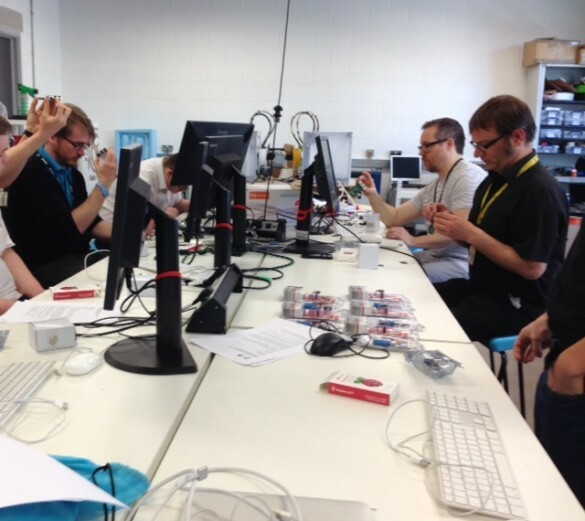 Everyone set up their own Raspberry Pi, Pi camera and microphone and learnt how to use openframeworks to create a range of interactions triggered by sound and motion. The best part was getting to work up some of the ideas that emerged for learning some basic code. Lots of people have been emailing us to say the camera feature on Somantics for iPad has stopped working. The problem is with the IoS 8 upgrade. At the moment Somantics is not available on IoS 8, although we are working on this. The desktop version still works perfectly. Bear with us, we will have this resolved as soon as we can. We are all thrilled that Somability has been shortlisted for the prestigious 2015 Accolades. This week we met the judges, who had the opportunity to see Somability in action at the Gadlys Learning Curve Day Centre in Aberdare. After many months of design and development with our friends at Rhondda Cynon Taf, Somability version one is now free for you to download. At this stage we are offering a Windows version which needs a Kinect camera. To download the Somability for Windows click here and to download the Installation and Usage Instructions right click here and choose “Save As”. 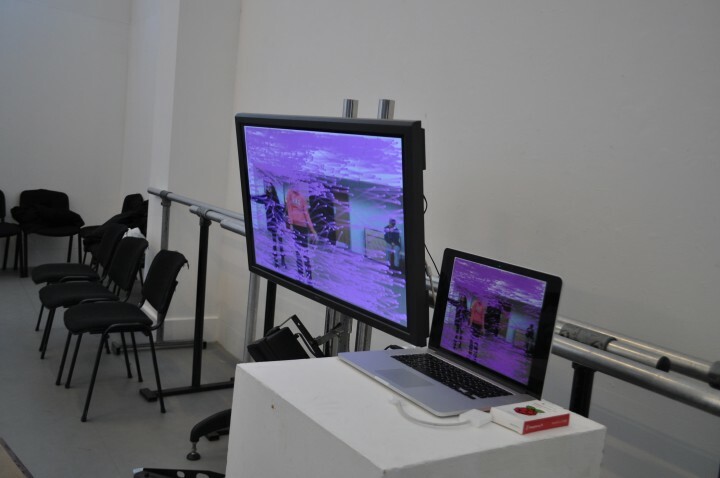 Inspired by What the Body Does Not Remember, performed by Ultima Vez, we used some of the Raspberry Pi prototypes to try out themes of risk and relationships. The young dancers worked with Tamsin Griffiths and Cariad Interactive at the Sherman Theatre over three days to deliver a totally energetic and compelling performance. The our hard work in rehearsals and development paid off and everyone rose to the occasion. 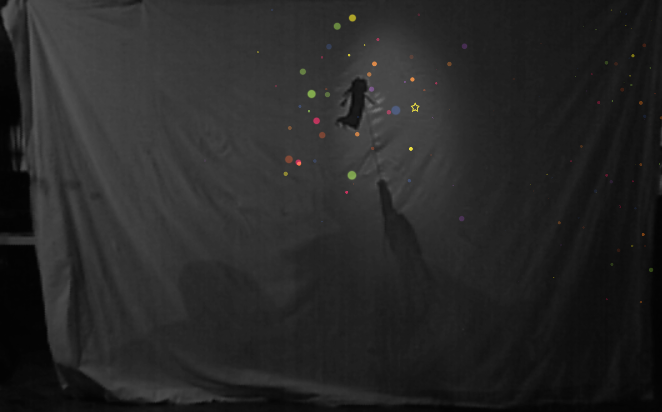 Each of the sequences – Call and response, Flow, Mirror and Space – enabled the performers to reach new levels of dynamic interaction. The Raspberry Pi delivered, thanks to James and we are now preparing to use the code with some new partners in SEN schools in South Wales. We will be back at Arts Depot on 25th and 26th April, working on a new project with Noah’s Ark children’s hospice. 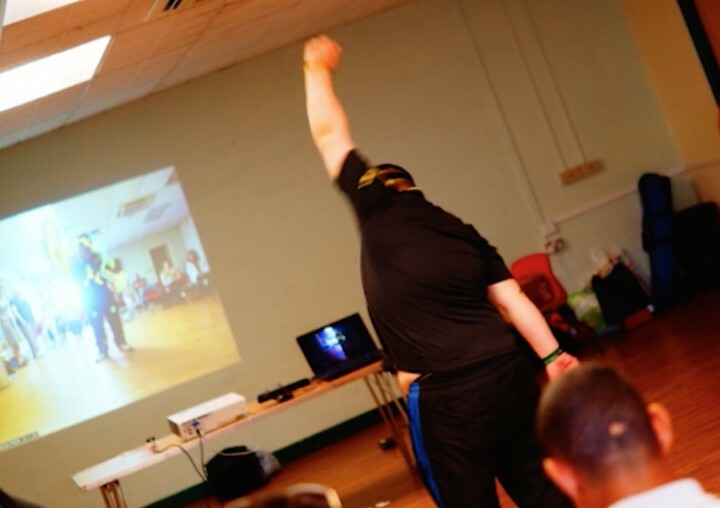 James has all the apps running well on the Raspberry Pi, so we were able to do a full rehearsal, linking the sequences together and making some of the moves more responsive and dynamic. Looking forward to the big night! 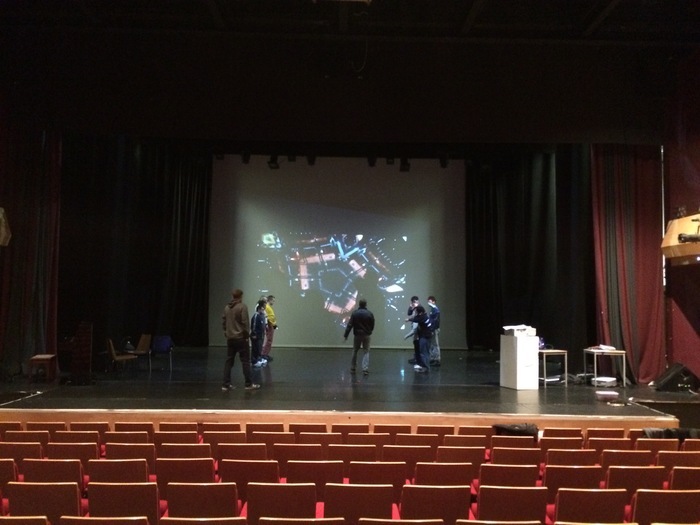 This week we took our workshop onto to the Pentland theatre stage. The performance is really starting to take shape and the prototypes for Somatopia and the Raspberry Pi are coming to life. One more workshop before the main event for Clive on 21st February. 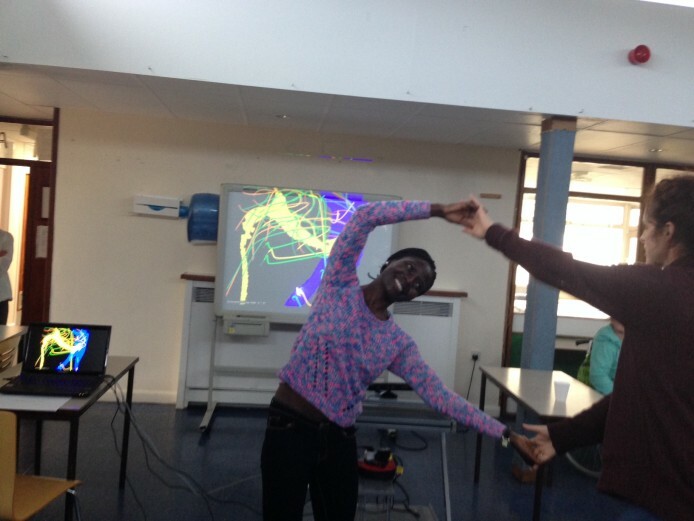 Last Sunday we headed off to Arts Depot in Finchley for the first of our Clive workshops. We began our session with a percussive warm-up and revisited some of our favourite ReacTickles Magic Apps, Expand and Orbit. Everyone enjoyed seeing the effects of their actions, adding lovely flowing movements, using Somantics Sparkles, Kaleidoscope, and Silhouette, simultaneously exploring speed, direction and body parts. 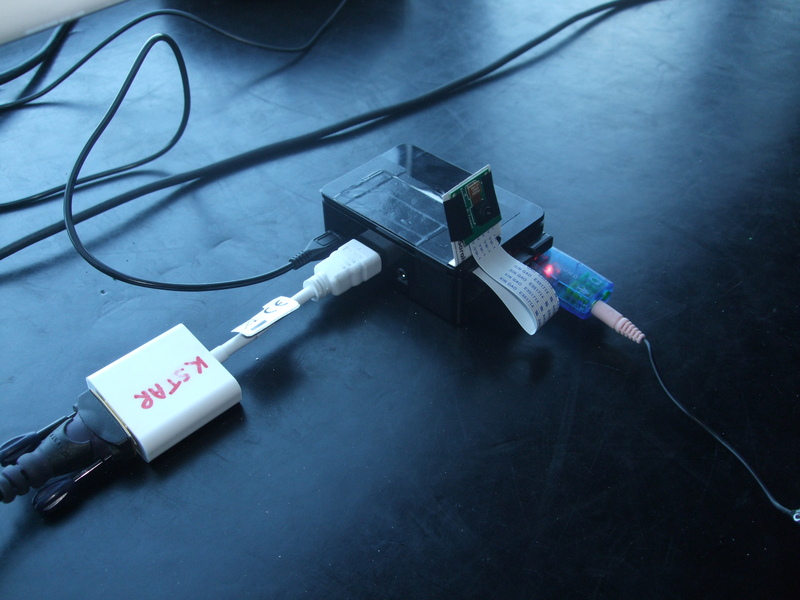 Everyone responded positively to our new Somatopia concepts for Raspberry Pi. The group contributed some great ideas for the themes we are proposing: Cause and Effect, Flow and Space. Already, there is excitement for the performance on the 21st Feb.
Beginning on 18th January, we are running workshops with Arts Depot. 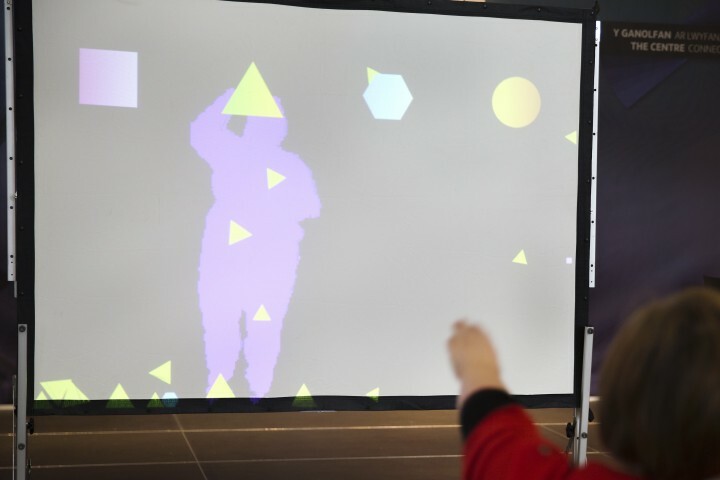 The workshops will be a pilot for developing our resources for Somatopia – and a test bed for inclusion by inviting adults with LDs to take part in weekly activities that culminate in them choreographing and presenting a performance using interactive digital artworks. 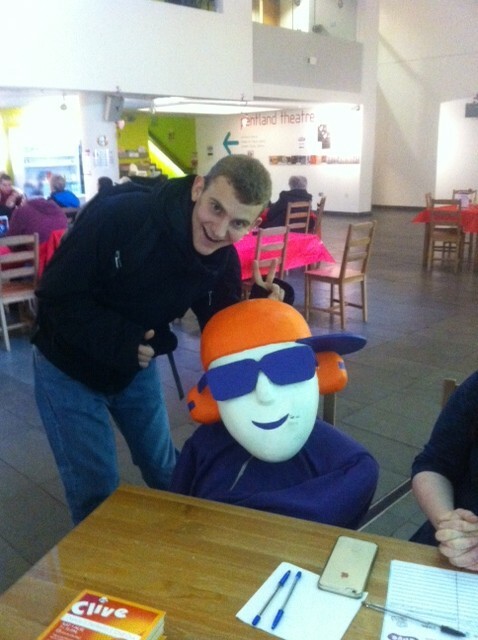 A celebratory event was held on 11th November in the Wales Millennium Centre. The event constituted a brief introduction to the project, followed by a dance performance and “open mic”, where members of the audience could join in. 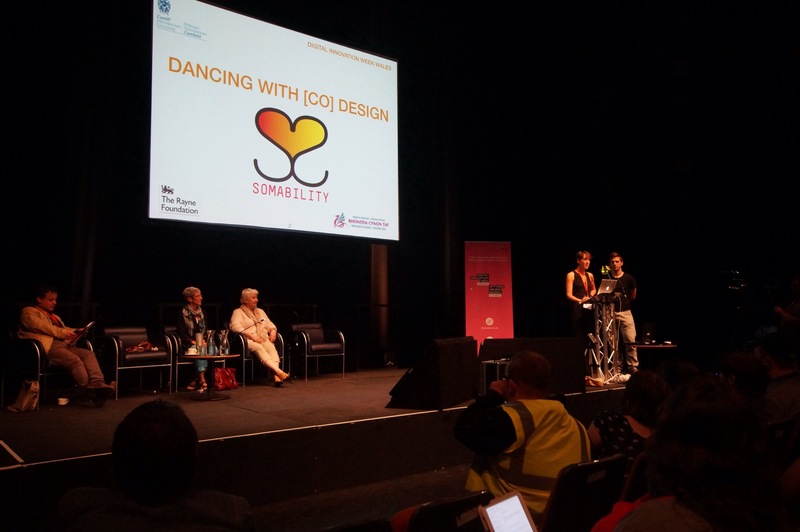 The public stage was adapted for wheelchair users and guests from academia, the arts, service provision, Welsh Assembly Government, RCT local authority, and the media. The performers from the Gadlys Centre, together with Zoe from Artis Community, were very relaxed and moved with ease. 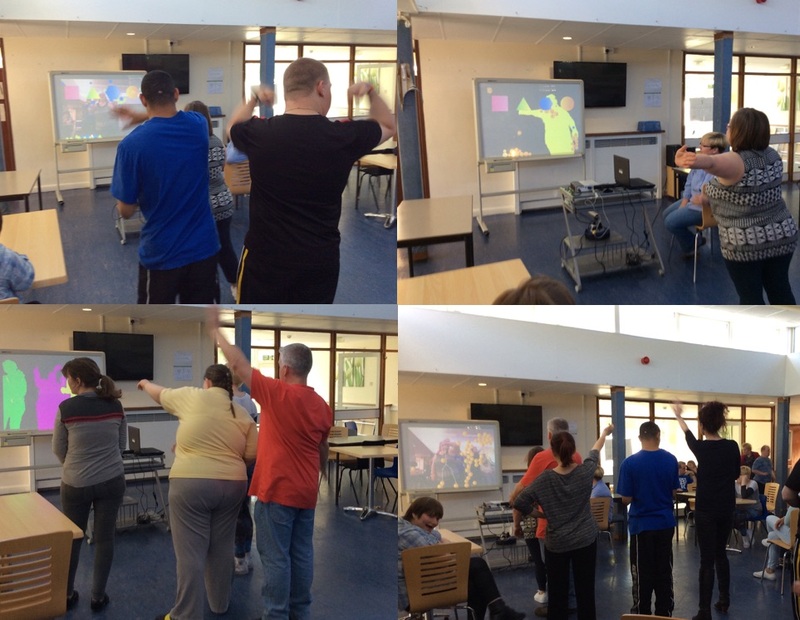 The more formal, choreographed, introductory dance was followed by approximately half an hour of service user led pieces, some individual and some collaborative. Everyone enjoyed themselves, so much so that the WMC has invited us back to do an even bigger performance. Congratulations everyone! 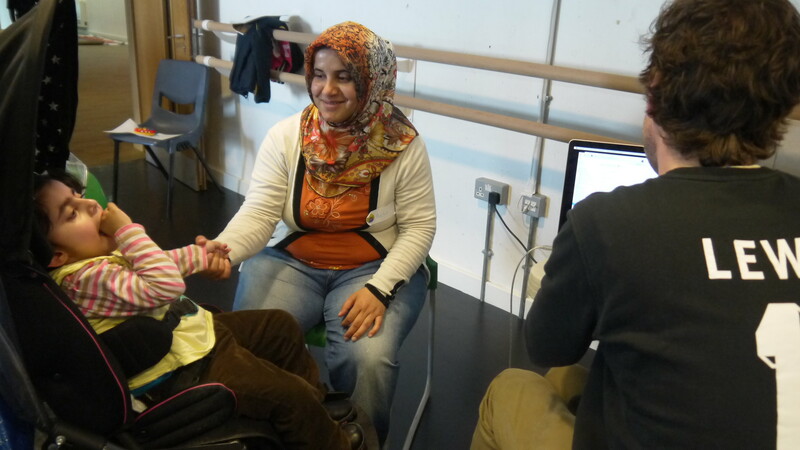 On Friday we celebrated the end of a truly wonderful term of dance and improvised interaction with Somability. The True Colours Gadlys group, gracefully performed work in progress under the guidance of Zoe and Linzi. All the friends and family in the audience were openly moved. This led the way to showcase the unique interactions and collaborations that Somability has enabled, as each service user independently used the technology without instruction. Monday evening the Sherman Theatre opened its doors to friends and family for our end of term Showback. The Superhero narrative was written and performed by the members of the Inclusive Theatre group, expertly steered by Morgan, Jay and Cheryl. Somability provided the backdrop for the flying scenes, the super hero machine and the finale, as good and evil are united in friendship. Watch this space for “Stuck in the Mud“, our next inclusive theatre production in August. Compelling Somability Dance performance from Rhonnda Cynon Taf Skills for Independence and Artis Community. True improvisation, demonstrating the joy of visceral engagement emerging through actions rather than plans. Kath’s narrative put the experience into context as she described how the project has been transformative for service users, providing the key to new friendship and independence. Cultural Patterning of Movement and Meaning: Knox, C. 1992, p172. 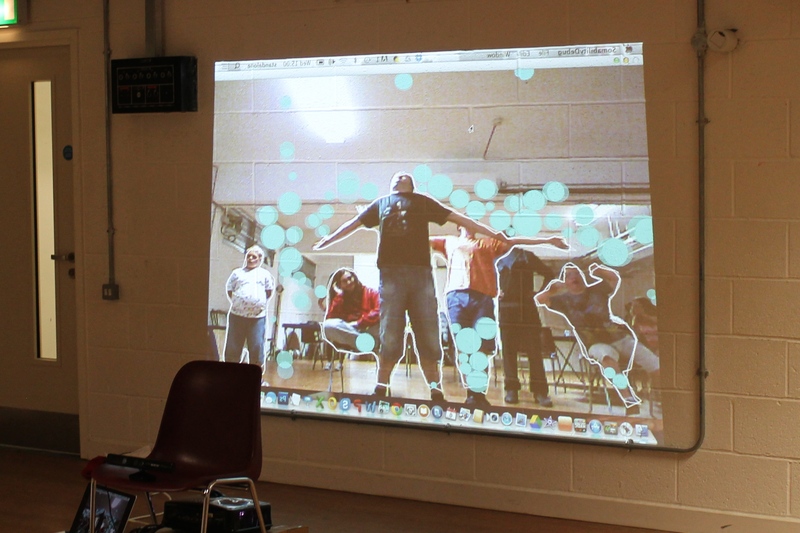 Our presentation at DIWW, “Dancing with [co] Design”, will focus on the potential of camera and projection technologies to extend the typical, sometimes limited, range of movements among people with profound and multiple learning difficulties (PMLD) in their day service settings. 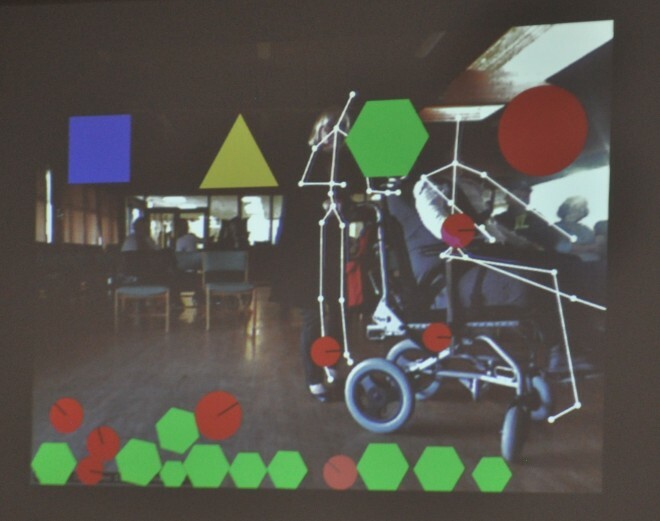 We will describe our co-creation methods for Somability, and how we are now visualising and generating graphical representations of body movement in real time. The event takes place at the iconic Wales Millennium Centre, Weston Studio. To enrich the experience of digital innovation, we have invited our partners in Somability to offer a preview of work in progress. This short performance with the True Colours dance group, aims to reveal the poignancy and sensitivity of the relationship between carers and service users with profound disabilities, and to invite the audience to reflect on their own experience of participation. Dancing with [co] Design will be introduced by Marek and Wendy. The Somability sequence will be performed by True Colours, co-ordinated by Zoe Martin and Linzi Robinson from Artis Community with service users from Rhondda Cynon Taf Skills for Independence. Cariad Interactive presented work in progress at RE.WORK as part of London Technology Week. The question for participants was “how will emerging technologies and innovation impact the future of education?”. Our presentation began with a quote from Fals Borda, (1995) “do not monopolise your knowledge nor impose arrogantly your techniques, but respect and combine your skills with the knowledge of the researched or grassroots communities, taking them as full partners and co-researchers” to explain our approach toward community co-creation. Ending with a quote from Brenda Laurel (2003) which nicely captures our methods, including paper prototyping “…to design objects and experiences that enable people to perform themselves somewhat differently in those same situations-with greater pleasure, ease and agency”. The Sherman Theatre Creative Learning team invited us to stage some of the Somability and Somantics prototypes in the foyer to coincide with Easter holiday events for children and the Inclusive Theatre Group. The prototypes needed no introduction as the groups were able to join in freely and explore independently. The only problem was the light, streaming in through the large windows on possibly the sunniest day of the year so far. 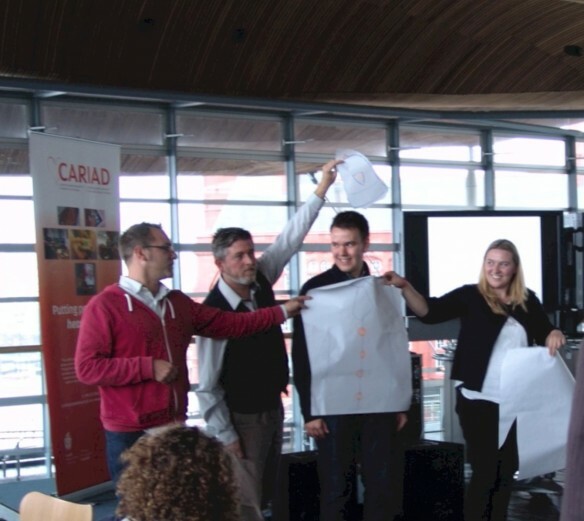 Following a very successful paper prototyping workshop at the Gadlys Learning Curve last November, the Cariad Interactive team spent two days last week trying early technology prototypes. Learning Curve support staff, led by Kath Ritchie, together with Angharad Lee from the Sherman Inclusive Theatre group and Zoe Martin from Artis Community, contributed ideas based on four broad themes, inspired by Laban’s movement analysis. 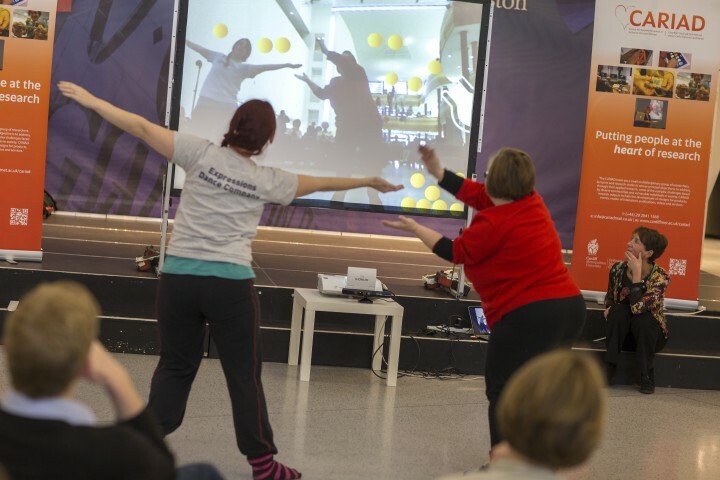 Weight, space, time and togetherness were explored in the context of how service users may be able to extend their range of movement and expressive communication within the community centre setting. 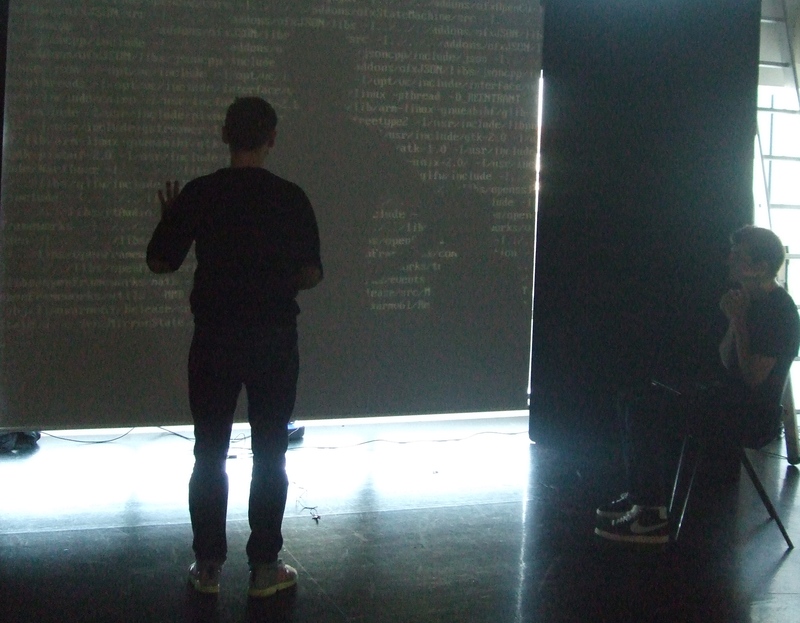 So last week we put the ideas to the test, setting up the prototypes on the new Novatec laptops, and using Kinect as a motion capture input device. 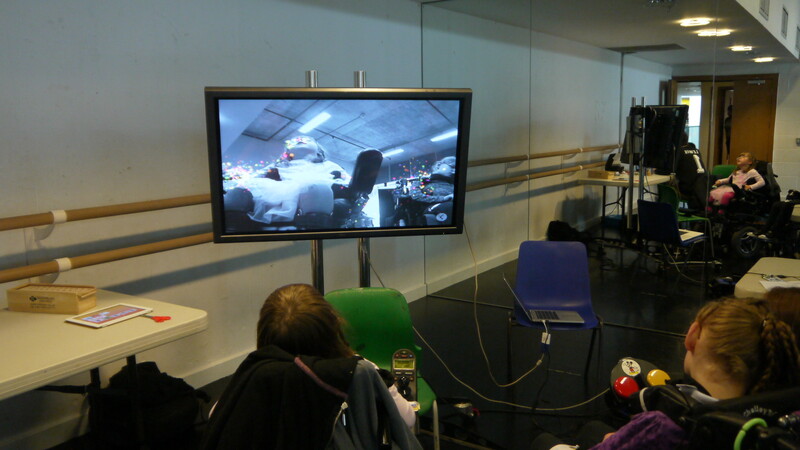 During the first session, at Gadlys, all the service users had a chance to try out Somability in the main room. Everyone seemed to be having a lot of fun and the range of movements were dynamic and exaggerated. As the goal of the project is to “make movement irresistible” we were all delighted at the level of engagement and peer interaction. After some overnight modifications to the interface, the action continued for a second day, using a nearby hall which provided significantly more space. This was especially helpful when we had three wheelchair users, other peers and carers all interacting together. Leah McLaughlin, CARIAD, did an amazing job at capturing the sessions, which were reviewed by a small focus group, together with the carers, Feedback has been overwhelmingly positive. Joel and Marek are now moving forward with our prototypes, adding new modes for graphically interpreting body shape, mirroring and cause and effect; Pete is busy making proposals for the interface aesthetics. Marek and I delivered a novel paper prototyping workshop together at the Arts Council of Wales Annual Conference. This technique, pioneered by Joel and Pete, challenged delegates to design simple prototypes for a “creative future” smile detector application. There were 50 delegates, divided into 10 teams, with only 45 minutes to create a paper prototype for their concepts. All the teams rose to the occasion, and managed to explain their ideas in less than a minute, with smile powered cars, air travel (air smiles!) and charity collections, raising smiles all around. 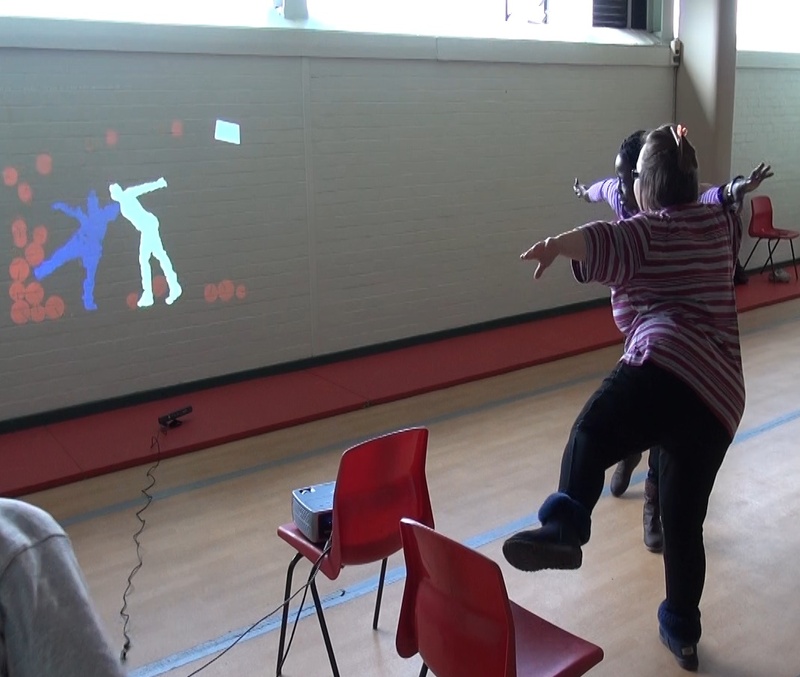 We are thrilled to announce that our project, Somability, which is being hosted with Cardiff School of Art and Design and co-design partners, Rhondda Cynon Taf Skills for Independence with Artis Community, has been awarded funding through the Rayne Foundation. 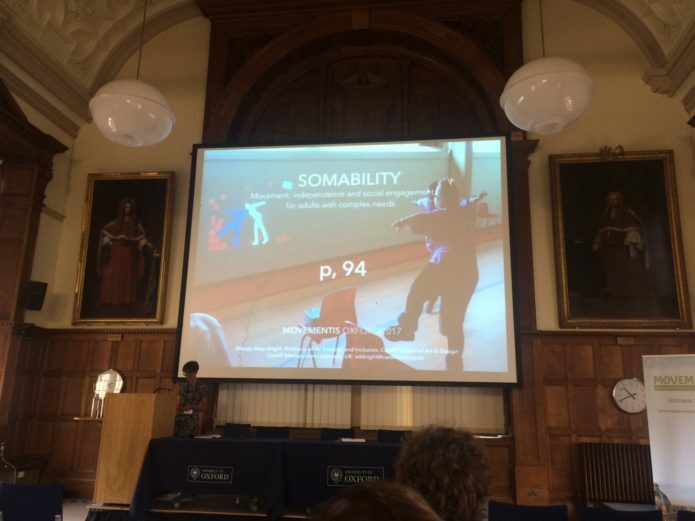 The ideas for Somability came about following a design Lab that we ran with adults with learning difficulties, which involved them taking part in stimulating, creative, movement activities in their day care settings. 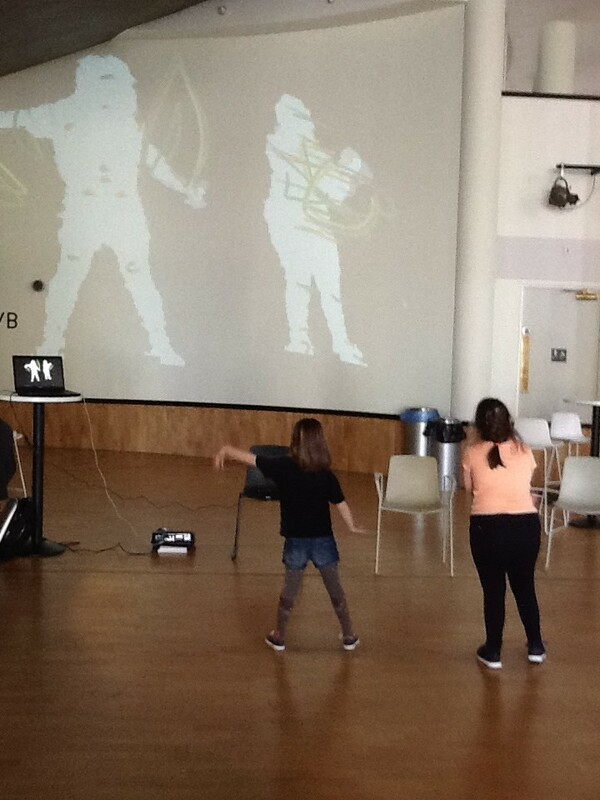 Our experiences from the lab inspired us to try to find ways to offer these communities access to recreational activities that use the same affordable technologies as the wider population, with musicality and rhythmic, dynamic movement as the primary mode of expression. We are grateful to Tim Leroy at Novatec for donating laptops and Andrew Spooner at Microsoft for donating Kinect cameras. 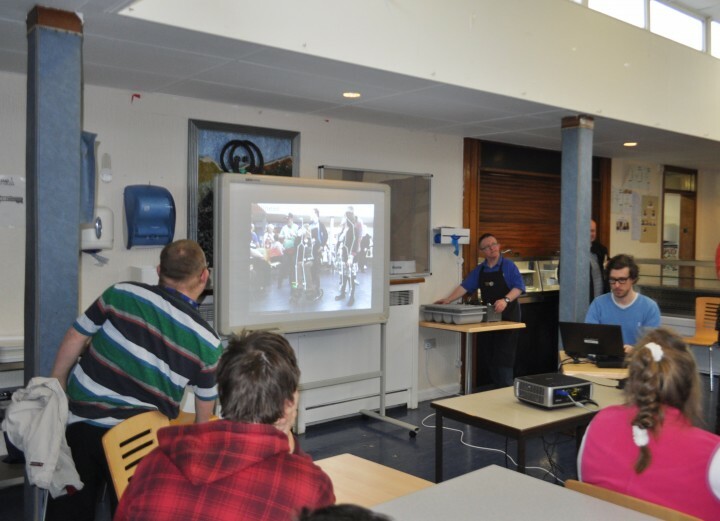 Thanks to the enthusiasm of Alex Jones, we set up Somantics on the iPad and desktop with a projector at the Danybryn Leonard Cheshire home. Somantics Sparkles worked well with wheelchairs moving closer and further away, and even limited facial actions brought the interface to life. We created some very dynamic sweeping movements using lightweight batons and Windmills, although Kaleidoscope was definitely the favourite, triggering lots of laughter and peer to peer encouragement. 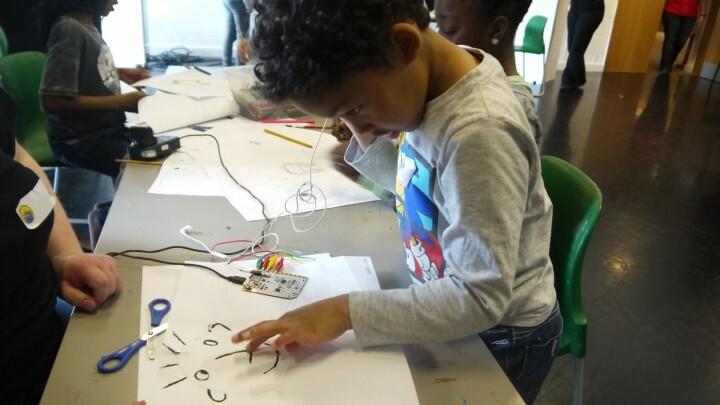 This ideation phase of Enfys has focused gaining vital inspiration for interaction design, to ensure that it is developmentally appropriate and usable in the playgroup setting. The first visits to the Cylch Meithrin Playgroups provided vital contextual information and enabled us to get to know the playgroup leaders and peer-to-peer dynamic. An extensive literature review alerted us to key factors that must be considered when designing for children, regardless of technology. In our early sketches we have been attentive to the role of adults in scaffolding the child’s learning, the importance of structure and collaboration, the use of objects and materials, the sensory environment, and the benefits of rhythmic actions in language development. 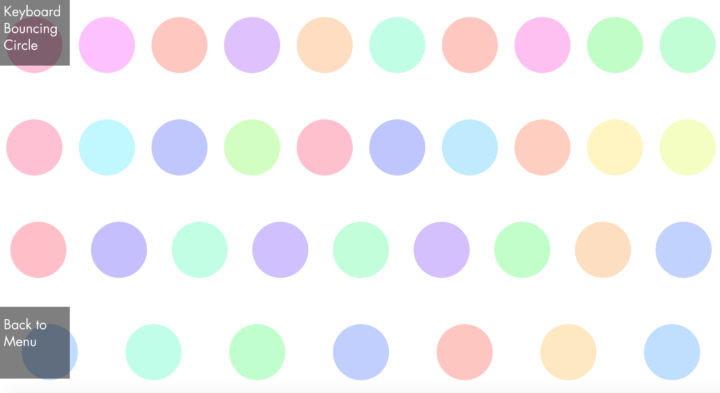 Hello world, we are working on the Cariad Interactive site as we speak. In the mean time, please check http://www.somantics.org for all the details of our latest projects.